Lake Union is a place to paddle where you’ll never get bored. You have to dodge all the power boats, there are enough wavy areas and calm areas to keep things interesting and in your comfort zone, and there are so many interesting houses and boats to look at! Keep to the sides of the lake for the most part and always be on the lookout for boats when you’re crossing parts of the lake. Remember when going through narrow areas (like under a bridge) there will be more waves. Boaters are supposed to slow their speed to keep the waves down, and I think they do a pretty good job, but there are still going to be waves. From the north end you can get in NEAR Gas Works Park. We accidentally launched from Gas Works park, not noticing the “no launch” sign due to toxins. But if you park in the Gas Works parking lot and head East then you seem to be in the clear. When in doubt there’s another launch point further east, straight across from N 35th St with nearby parking. 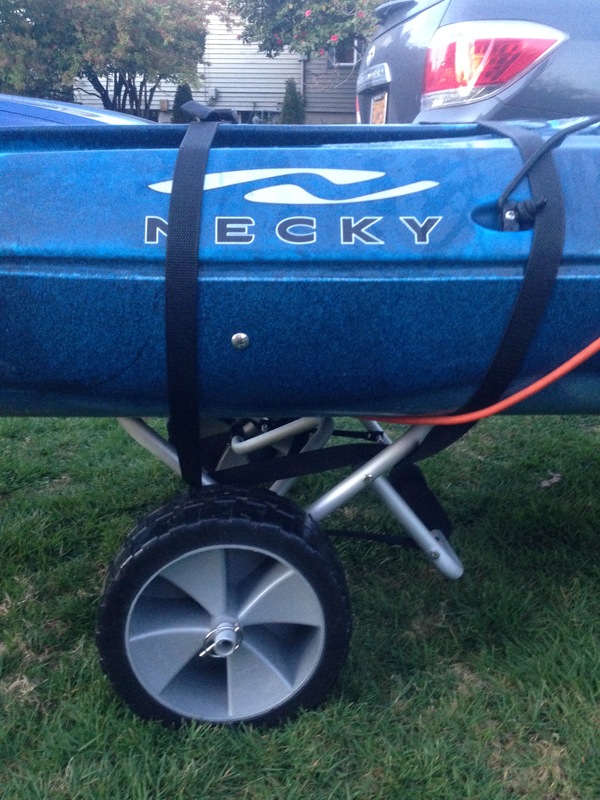 On this trip, one of our first, we realized even only hauling the most basic gear (PFDs, paddles, our 80lb kayak, and a couple waters…we didn’t know about bilge pumps or skirts then) we wanted a set of wheels. We bought a small cart on sale and mostly successfully used it (except on that mile hike to Ross Lake) for over a year before finally upgrading to the TMS cart, shown below. Finding balance: you’ll need to find the sweet spot on your own kayak but start in the middle and try lifting up the kayak in the front by the handle. It should be about level and easy to pull. But first you have to tie it on. We’re using one cord, because that’s what came with it, but I think if you get a second cord that will be easier. Buckles with single strap and two bungees – top view. 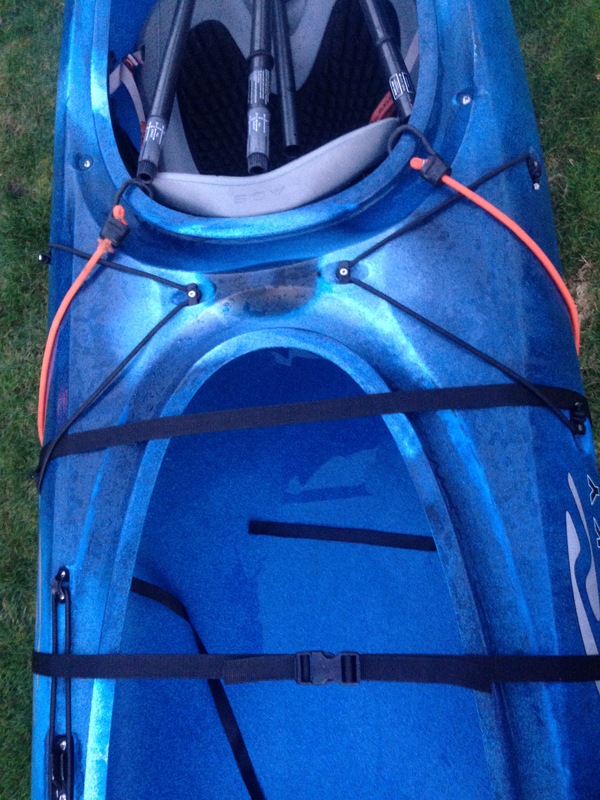 If the strap isn’t looped around and wide apart as shown the kayak will swerve side to side as you’re trying to pull it straight. The strap crosses front to back on both sides. 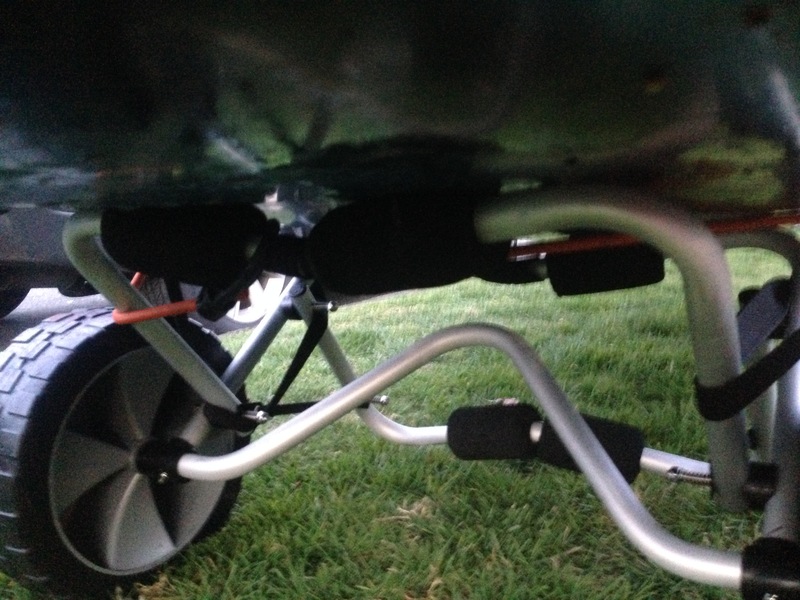 The bungees help keep the kayak in place. There’s nothing more embarrassing than holding up traffic at a crosswalk because your kayak fell off the cart, whether or not “peds rule” in Seattle. We did that twice before finally figuring it out. We take the pins out (then put them back in once the wheels are off) rinse the wheels off in the water and put them in our hatch. Then we strap the cart on top of the hatch with the hatch buckle. You can run the whole thing back to your car instead, but we’re into saving those precious minutes for paddling.